It's Monday - which means time for another Minute Beauty review! This time it's a brand that hasn't been reviewed on my blog yet - The Saem. I got this shadow this summer, as part of a The Saem haul I did. It was a bit of a wildcard purchase - I am usually not big on these types of colours, and am very wary of any sort of 'cream, jelly, pudding' shadows, unless it's a brand I know. However, this has since become a must-have addition to my routine. Let's see what I enjoy about this brilliant little shadow! First of, the texture. The name is misleading - the texture has nothing to do with jelly. It feels a little 'bouncy' and creamy, but not gooey at all! Somewhere between a gel eyeliner and a baked shadow (I know, weird). The plastic 'stopper' keeps the shadow compact and prevents it from crumbling on impact. The tub itself is heavy-duty plastic that I've dropped multiple times, but never had any issues with. So two thumbs up for that! The shadow, albeit really sparkly, is super smooth, and well pigmented. It has beautiful multi-coloured glitter scattered through, giving it more dimension. I am serious - you will need a good makeup remover to get this off. I swatched the shadow on my hand, took a shower, and I can still see where it was! The only small gripe I have is that the colour is not exactly what you see in the pot, for some reason. It looks a beautiful cranberry red in the pot, but it applies with a 'rusty' undertone (that's actually more like the label of the shadow). 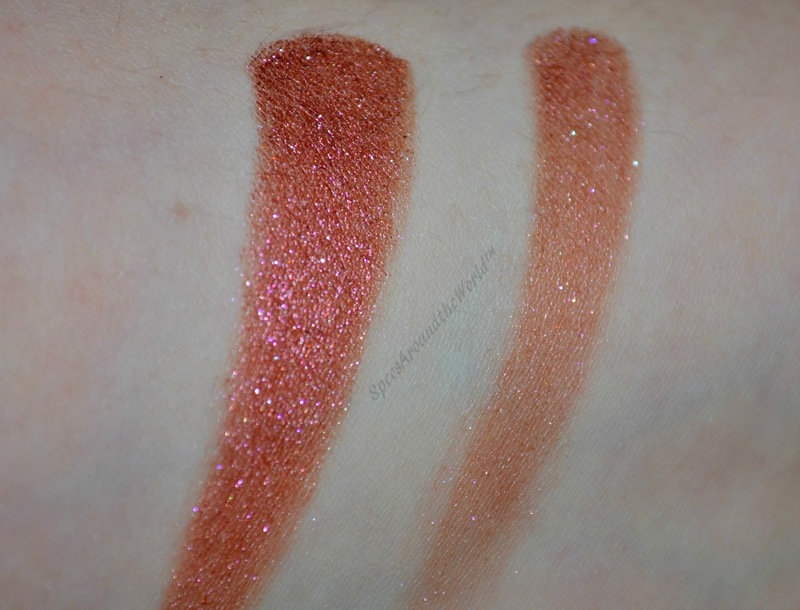 The left swatch is the shadow applied wet, the right dry (no primer). The manner of application makes a world of difference in both the pigmentation, shade and intensity of sparkle. As you can see, the 'wet' swatch has a more intense colour payoff as well as actually having a cranberry red sheen to it. I enjoy using this eyeshadow on both casual and special-occasions makeup. It pairs beautifully with browns, pinks, golds, but also with bolder shades like purple and green. Or just swipe it across the lid, add a little brown Sepia Ink eyeliner, mascara and I'm good to go for most occasions! All in all, I love this! It's a bit of a daring shade, but you can tone it down by applying lightly, or go all out and apply it wet for full impact. The lasting power and gorgeous colour makes it a must-have in my book! If you have someone who can grab it for you - go for it! Have you tried shadows from The Saem? I'd love to hear about it!